Tonight’s dinner was one that I was super sad to see there wasn’t any left of. It was amazing and so delicious so after a long time not sharing a recipe I figured it was time to share one. I didn’t measure as I was cooking though so these measurements will be an estimate. I hope you are able to recreate and enjoy this meal as much as we did. 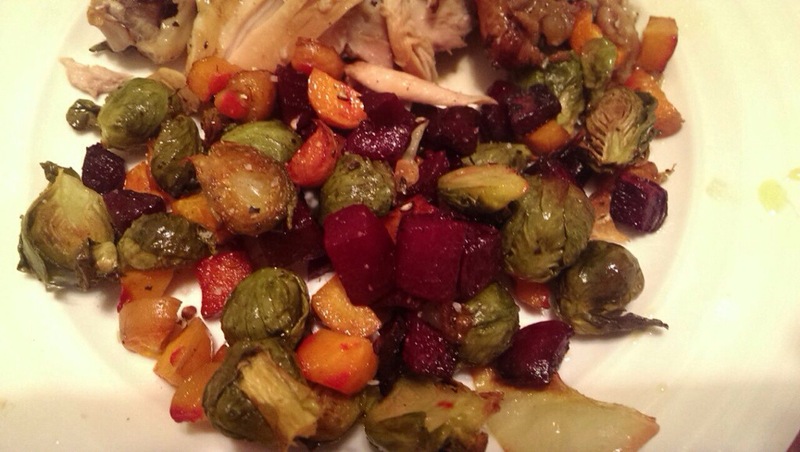 The nice part of the veggies is it’s so easy and you can use pretty much any fall veggies you have on hand. 1. Preheat oven to 195 C (380F). 2. Place chicken breast up in a roasting pan (ideally one with a lid). 3. Place garlic and onions around and on top of the chicken. Sprinkle the basil on top of the chicken. 4. Pour the balsamic vinegar and olive oil over the chicken. 5. Season with as much salt and pepper as you feel is necessary. I generally do a good amount of pepper and a few turns of our salt grinder. 6. Place lid on pan and put it in the oven. 7. As a rule I cook our chickens that are this size for 2 hours but sometimes it’s more and sometimes it’s less. You just need to keep an eye on it and a meat thermometer is always handy. You want to make sure the juices from the chicken run clear. 1. 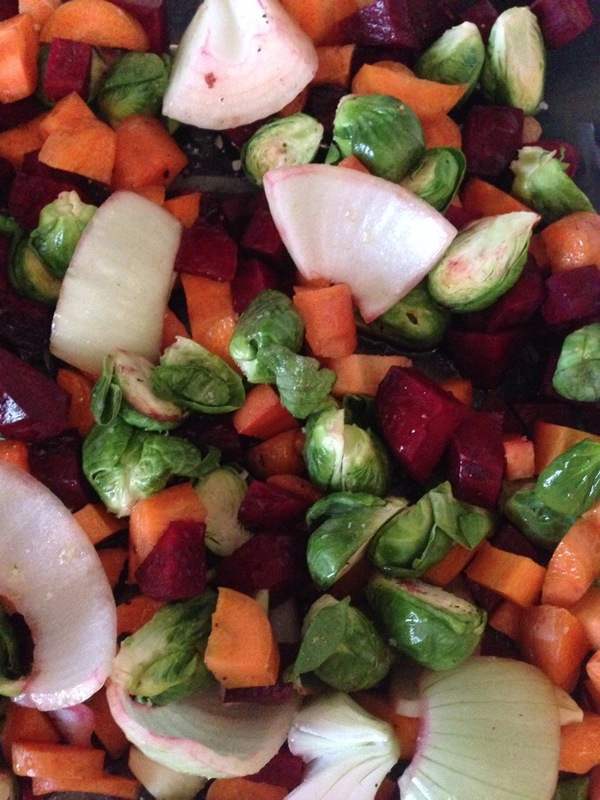 Place all veggies in a glass baking dish. 2. Cover with oil (or if oil is hard place chunks in it and once melted in the oven be sure to stir them) and top with salt and pepper. Be sure to mix it all up nicely to make sure everything is coated with oil and salt and pepper. 3. Cook in oven (350F) for about 20-30 min depending on size of chunks of veggies.